Your purse will match your awesome style carrying the LOVE Moschino® Super Quilted Clutch. Shoulder bag made of man-made materials. Fold-over flap with magnetic snap closure. Chain link shoulder strap. Brand name hardware at front and back. Flat base to provide upright structure. Custom lined interior. Imported. This item may ship with an attached security tag. Merchandise returned without the original security tag attached or a damaged tag may not qualify for a refund. Measurements: Bottom Width: 9 1⁄2 in Depth: 1 3⁄4 in Height: 5 1⁄2 in Strap Length: 50 in Strap Drop: 21 in Weight: 12.8 oz This product may have a manufacturer's warranty. Please visit the manufacturer's website or contact us at warranty@support.zappos.com for full manufacturer warranty details. 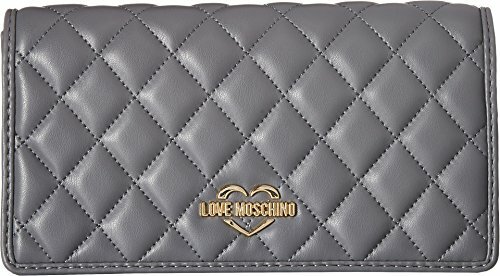 Your purse will match your awesome style carrying the LOVE Moschino® Super Quilted Clutch.